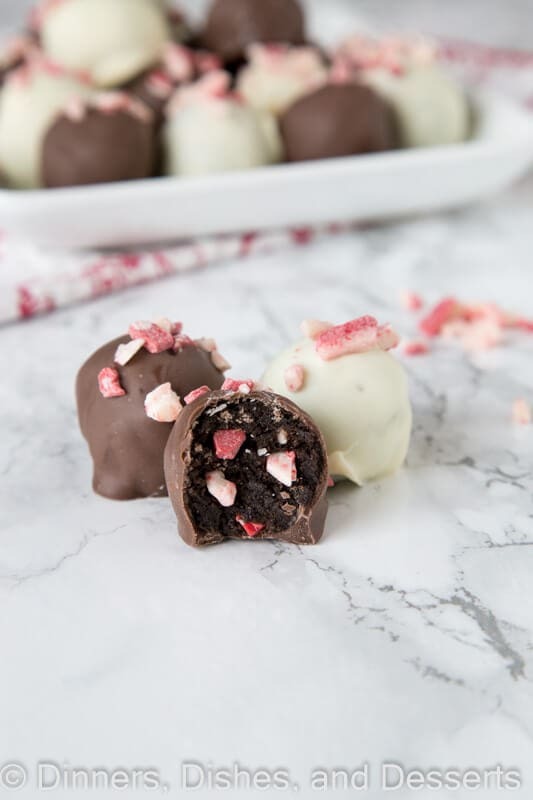 Peppermint Oreo Truffles – classic Oreo truffles with bits of peppermint pieces to make them festive for the holidays. I think that the month of December should be about all things peppermint. 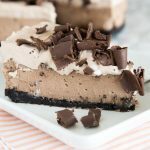 Chocolate and peppermint is a magical combination. And this time of year it is all people think about. I love it all year round, but I may be in the minority there. 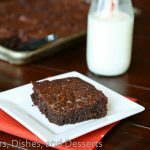 Mint Chocolate Chip Brownies happen in May around here. 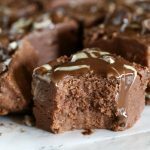 I posted Grasshopper Brownies earlier this week, so I think you can tell that I am obsessed. Every year for Christmas, my husband’s family makes this Grasshopper Pie for dessert. It is so creamy and I look forward to it every year. But I have to find ways to get chocolate and mint in other forms during this season. 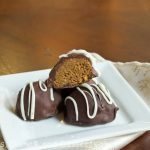 A couple years ago I made Mint Oreo Truffles, and they were such a big hit. So this year, I decided to mix in pieces of peppermint and change it up just a little. 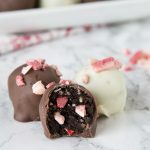 I used the Andes baking bits to give a little peppermint flavor, color, and add a little crunch to these Oreo truffles. Oreo tuffles come together in just minutes. You use a food processor to crush the Oreos, and then blend the cream cheese with it, so it comes together. I like to use a cookie scoop so that I know all the truffles are the same size. Oreo cookie truffles are kind of a classic. sometimes dipped in white chocolate, sometimes milk. 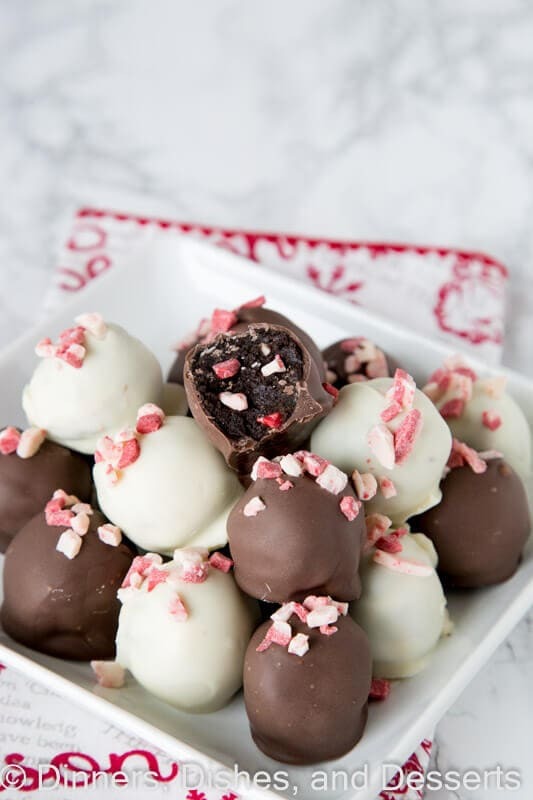 You can pick how you want to dip your peppermint Oreo truffles. I did half in white almond bark and half in chocolate. While the chocolate was still wet, I sprinkled with a few pieces of peppermint baking bits. 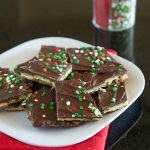 You could drizzle with the opposite color chocolate, sprinkle with Christmas sprinkles, or color sugar. Or just leave them plain. Totally up to you. They will taste minty and delicious no matter what! 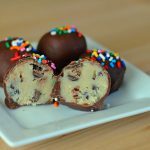 This oreo truffles recipe would be fun to do with all the different flavors or Oreo’s too! The golden Oreo’s, peanut butter, cinnamon or one of the other crazy ones they keep coming up with! 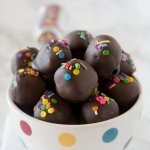 Knowing how to make oreo truffles is a skill that even kids can have. So easy!! 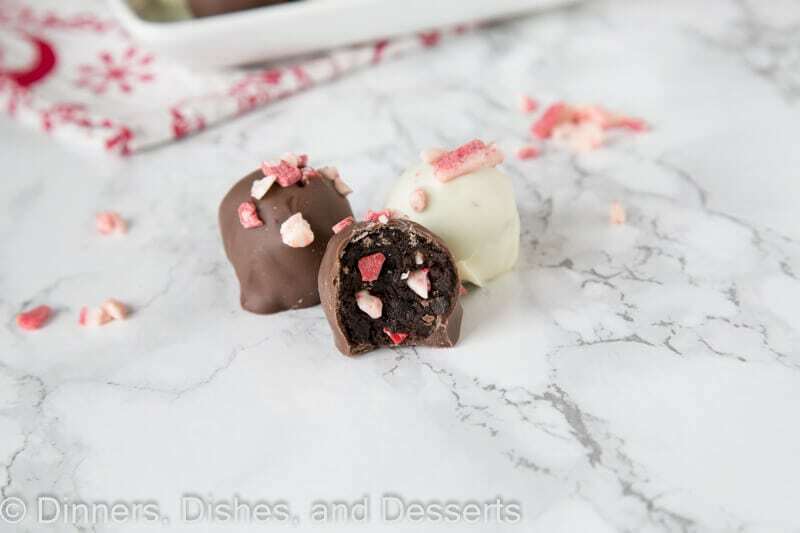 So get out that food processor and start making this oreo truffles recipe today! 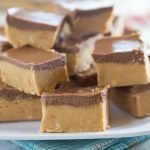 They will be a hit on any holiday dessert tray, and are even great for cookie exchanges. 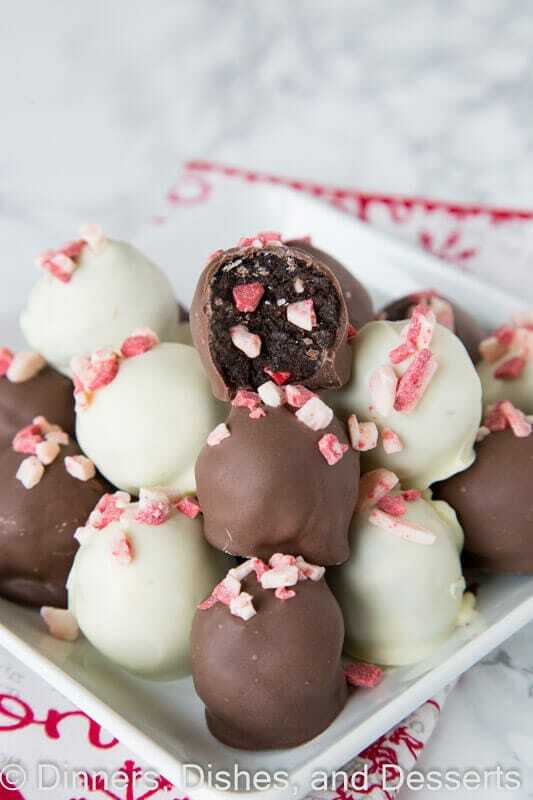 I have a cookie exchange on Sunday, and I just might be making another batch of these Peppermint Oreo Truffles to bring. 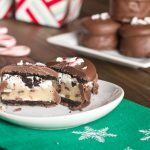 Peppermint Oreo Truffles - classic Oreo truffles with bits of peppermint pieces to make them festive for the holidays. In a food processor plus Oreo's until they are fine crumbs. Cut cream cheese into 1 inch pieces. Add to food processor, and process until well combined and no streaks. Add peppermint extract if using, and mix to combine. Fold in peppermint pieces. Roll into about 1 inch balls (I got 30 out of mine). 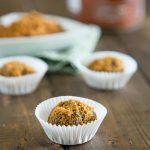 Dip balls into melted chocolate. 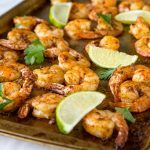 Place on a lined baking sheet to harden. Sprinkle on more peppermint pieces when the chocolate is still wet. 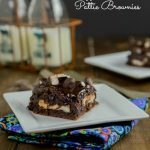 My kids can never get enough of the chocolate-peppermint combo! 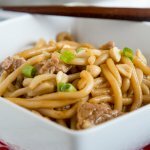 I can’t wait to make these for them! 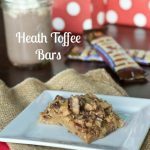 OMG these are the perfect treat! Truffles are the best. 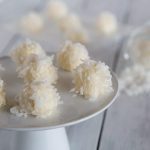 I have a slight obsession with truffles at the moment! These would be so fun for Mother’s Day! I just made truffles for the first time ever around Easter but I definitely made them too big. Need a smaller scoop for uniform size. Can’t wait for this minty treat!